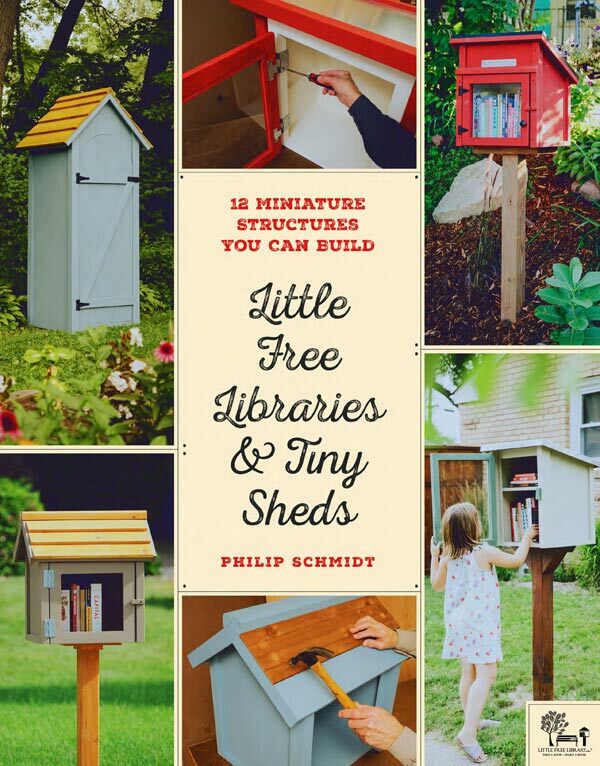 These ideas for building little free libraries are from the new book, Little Free Libraries and Tiny Sheds: 12 Miniature Structures You Can Build by Philip Schmidt. 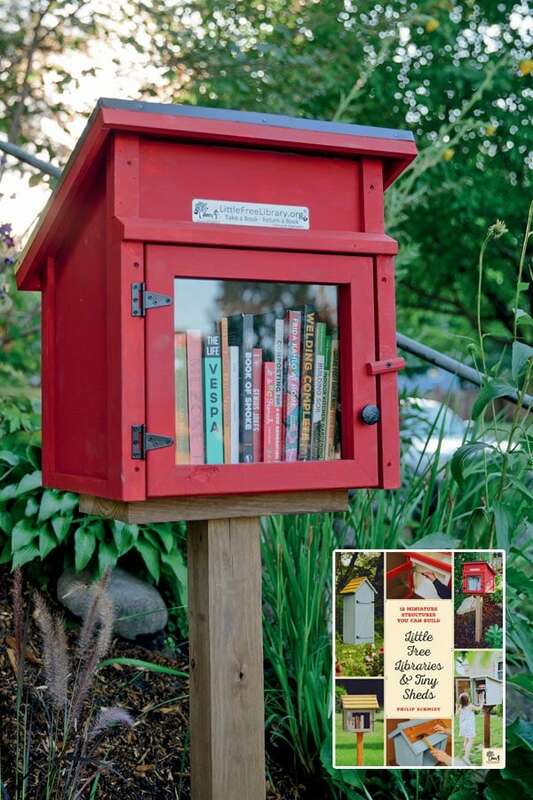 Build your own and start a community book exchange, trade garden seeds, or add a unique storage box to your backyard. The images in this article are used with permission from Quarto Publishing Group who also provided copies of Little Free Libraries and Tiny Sheds: 12 Miniature Structures You Can Build for me to review and you to enter to win (see below). Thank you, Quarto! Little Free Libraries are a fairly recent idea—I first saw one in our neighbourhood around 2010— but the basic concept has been around for ages. It’s a place to borrow and donate books. Or garden seeds. Or other non-perishable items that fit in the box. Probably on someone’s front lawn. A small house-like structure, resembling a tiny shed or birdhouse or kitchen cabinet, is placed near a roadside, available for neighbours to make use of the offerings. At best, they are a valued resource for good books, add character to the street, and provide a way to meet neighbours you might otherwise never encounter. At worst, they have crappy books no one wants, or fall prey to vandalism. Like most neighbourhoods, upkeep and community effort determine the outcome. The book has sound advice for success. 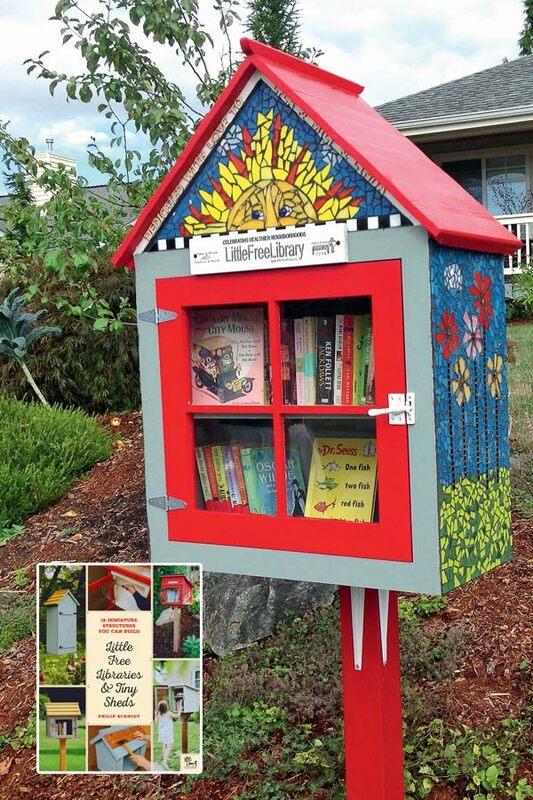 The Little Free Libraries non-profit organization says there are more than 75,000 free libraries around the world. Their website includes an interactive map where you can list your library or find locations near you. If you are considering hosting one, this critical discussion with a Toronto librarian is worth reading. For me—as a garden art-whimsy fanatic—it’s all about creating functional garden art. Quirky creativity with a purpose. Our front yard happens to be the waiting place for several school buses, so it seems like a no-brainer to provide a free library for the kids. And their parents. My plan it to create something with a nice long garden bench attached to it, so they can browse books and read while they’re waiting for the morning bus. It could work or be a silly pipedream. If my mission fails for whatever reason, the library can still have a place in the garden, for storing gloves and hand tools, or holding a giant pot of flowers, while adding some decorative bling. The book is packed with ideas and there are thousands more online. 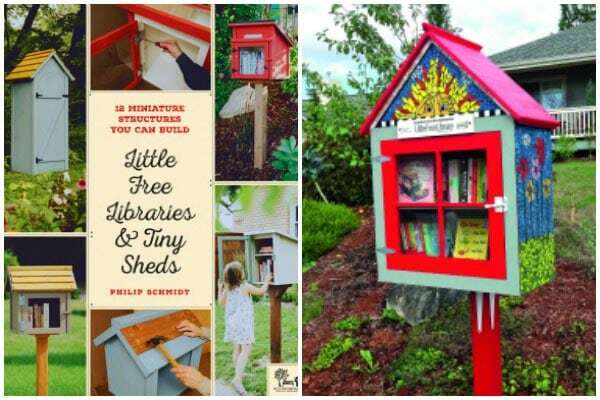 The Little Free Libraries and Tiny Sheds book includes building plans for 12 miniature structures and oodles of photos of little free libraries from around the world. There is also sound advice for running your own little library, to help ensure success. This next design would make a good mailbox too. For more ideas, also search the hashtag #littlefreelibrary on Pinterest. There’s lots of great ideas there. Entries must be received by May 20, 2019 at 11:59 pm EST. 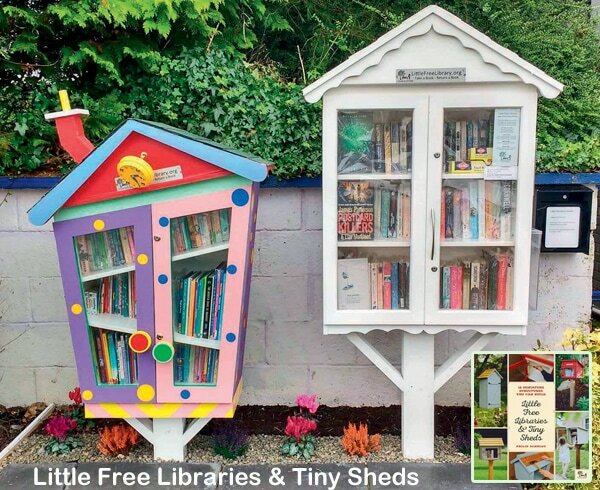 Prize: Little Free Libraries and Tiny Sheds (book). Value: $20 US. Exact prize is subject to availability and may vary from the one shown. Winner will be selected randomly from eligible entries and listed on this post after closing. Winner will have seven days to claim their prize. Canadian giveaway winners are required to answer a skill-testing question. If potential prize winner forfeits or does not claim the prize, prize will be re-awarded, at Empress of Dirt’s sole discretion. We do not spam! Your information is used for this giveaway only. If you would like to receive the Empress of Dirt newsletter, please sign up separately. Good luck! And, if you make your own little library, or have one in your neighbourhood, share it on the Empress of Dirt Facebook page. We want to see it!